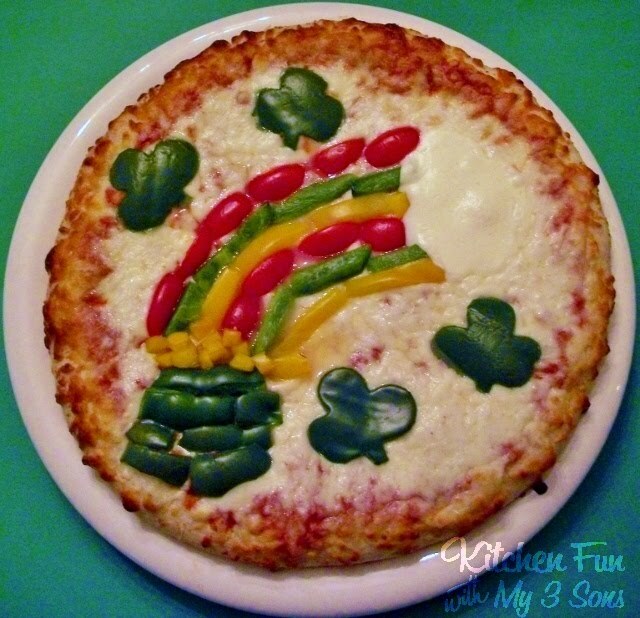 We made a few fun pizzas for St. Patrick’s Day and they are all very easy to make! 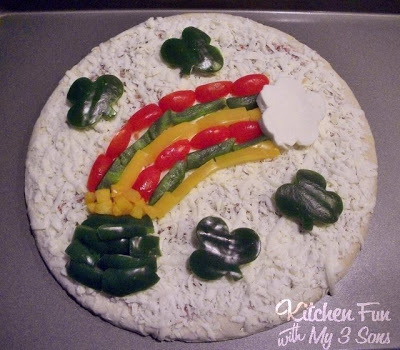 This Lucky Rainbow Pizza is just something fun that we did using a frozen pizza with chopped up peppers and tomatoes. My 8 year old just started liking peppers. This pizza might just get the kids to try peppers if they wouldn’t before! We cut up a yellow and green peppers into strips. We also had cherry tomatoes and cut those in 4 pieces (you could also use red bell peppers). We made a pot out of the green peppers (you could also use black olives). We chopped up some small pieces of the yellow pepper for the gold. We lined up the peppers and tomato to make the rainbow. We had fresh mozzarella that we made the cloud with, but you could use any sliced white cheese. We also cut out a few shamrocks from the green bell pepper with a shamrock cookie cutter. 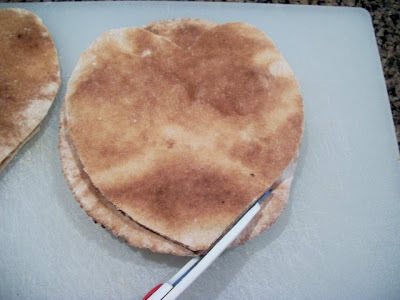 You could cut out small hearts and make it that way if you do not have a shamrock cutter. You can use any veggies that you have or maybe other veggies that the kids will like better. They will have fun helping make this one! Save one of the scraps for the stem. We just reversed the order and layered the chicken on first…then the mozzarella…then the pesto on top. Bake at 350 for about 8-10 minutes or until cheese is melted. Might get the kids to try some pesto! 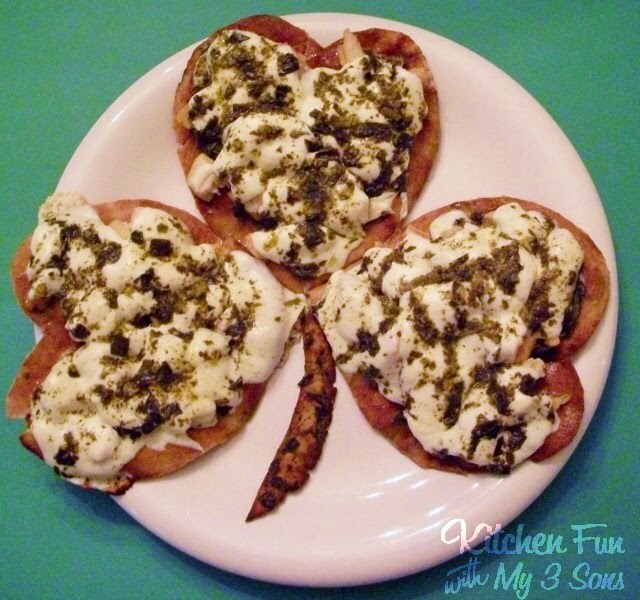 We made this Shamrock Pepperoni Pizza last year by just cutting turkey pepperoni with small heart cookie cutters and shaping them into clovers. Very easy to do! 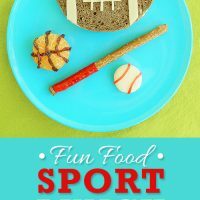 Here is our post from last year. 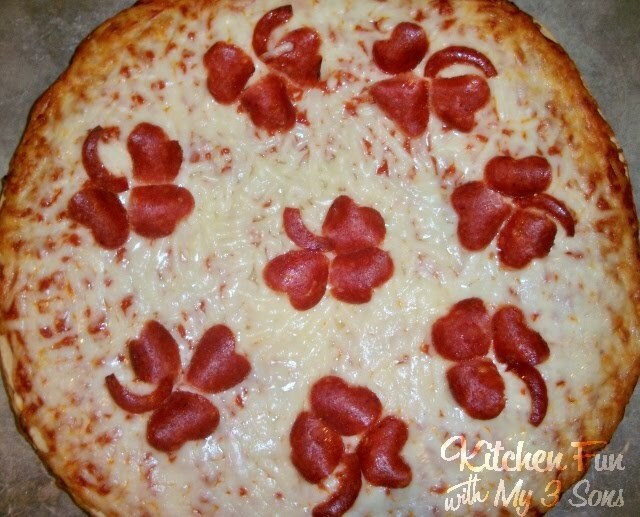 I love your pizzas. 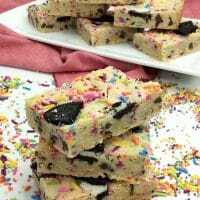 I will be giving it a try at our house for sure! Thanks so much for sharing! Stopping by from TGIF. Oh, I LOVE that first veggie one! (though the pesto sounds totally delicious!) 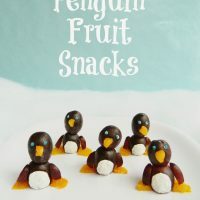 I'm going to pin this and share it on my PreschoolPowolPackets Facebook page! These pizzas are so cute. I love your ideas. I loooooove this!! What a clever idea. It turned out SO cute! I featured this at TGIF this week: http://www.livinglifeintentionally.blogspot.com/2012/03/tgif-linky-party-21.html – Come stop by and link up what you've been doing this week. Thanks for sharing your creativity with all of us & Have a GREAT weekend!